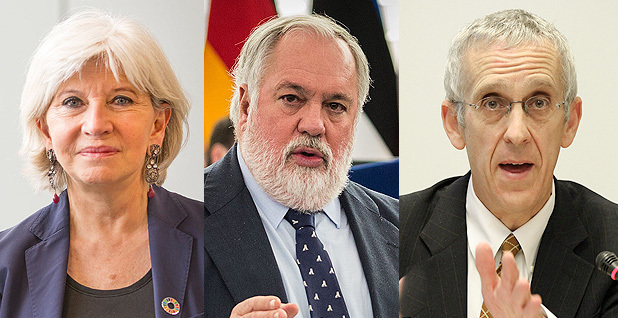 (From left) Three top architects of the Paris Agreement — French former top negotiator Laurence Tubiana, European Commissioner for Climate Change and Energy Miguel Arias Cañete, and former U.S. Special Envoy for Climate Change Todd Stern — disagree on whether countries can weaken their emissions pledges to the global accord. Photos courtesy of UNCC/Wikipedia (Tubiana), Claude Truong-Ngoc/Wikipedia (Cañete), U.S. Mission Geneva/Flickr (Stern). This story was updated at 12:13 p.m. EDT. One of the top architects of the Paris climate deal says President Trump can't offer a less ambitious target than his predecessor did, an opinion that buttresses the views of opponents to Paris in the White House. Laurence Tubiana, France's climate ambassador during the 2015 summit that produced the agreement, gave Trump no quarter in an interview with E&E News yesterday, reading a controversial provision to say Trump must keep the U.S. target or tighten it. That scenario would likely be seen among presidential advisers as a reason to withdraw from the global pact. "The text is very clear," she said, quoting Article 4.11, which reads, "A party may at any time adjust its existing nationally determined contribution [NDC] with a view to enhancing its level of ambition." "The sense of the direction is really progress; it's not going backwards," she said. She added that a force majeure clause allowing for downward revisions kicks in only if a country undergoes an unavoidable hardship and not, as in the current U.S. case, a change of political leadership. Tubiana's view tracks with anti-Paris hard-liners in the White House, who warn that NDCs, once issued, are effectively legally binding and cannot be revised except to be more ambitious. Environmental lawyers and the U.S. architects of the Paris deal dispute that interpretation. Trump aides who favor remaining in Paris have suggested issuing laxer commitments. The dispute over whether the Paris Agreement permits backsliding has handed exit proponents, like U.S. EPA Administrator Scott Pruitt and chief White House strategist Stephen Bannon, an advantage in the last week. Trump is now considered likely to announce a Paris exit, perhaps as soon as next week. Sources say White House Counsel Don McGahn adopted the opinion that Paris commitments could not be reduced last week, immediately before a meeting of administration principals on Paris, reversing his previous opinion and that of the State Department legal team and giving Pruitt and Bannon the upper hand (see related story). Tubiana acknowledges that if a country walks away from a prior target, "you don't have any judge to punish you," but the Pruitt-Bannon camp argues that domestic environmental litigants could cite the Paris deal and former President Obama's commitment to cut emissions 26 to 28 percent compared with 2005 levels by 2025 when they challenge Trump deregulatory actions in court. "There is a remedy," Marlo Lewis, a senior fellow at the Competitive Enterprise Institute, said in a blog post yesterday. "The U.S. government cannot join a pact affirming the moral necessity for 'ambitious' emission reductions without inviting climate tort and regulatory litigation." It's not clear if killing the Paris Agreement made it to White House chief strategist Steve Bannon's whiteboard to-do list, but some clues are there. 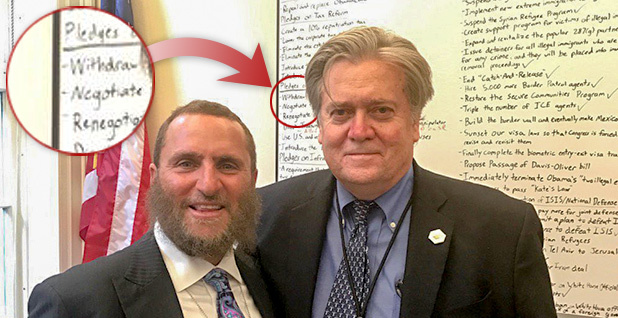 Photo courtesy of @RabbiShmuley via Twitter. Tubiana, meanwhile, dismissed an exit from Paris as a "very, very bad thing" for the United States, adding that she couldn't decide whether a new NDC or a Paris exit would be preferable. She said giving Trump cover to remain in Paris is not an objective. "It's not just a diplomatic exercise," she said. "If you consider Paris as a diplomatic success, in my view it's just not the case. The importance of the Paris Agreement was to be a framework for many, many actions to take place, and giving a sense of common objectives." Allowing the United States to change its target for political reasons, she said, would encourage other countries to follow suit and would damage the deal's signal to the broader global economy. "It's not about a five years' agreement; it's not about a 10 years' agreement — it's about the very long term," Tubiana said, predicting that the United States would return to the fold in the future and be welcomed back. Tubiana said she had not spoken with Trump advisers or State Department officials, noting that she is now working in advocacy outside the French government. European Commissioner for Climate and Energy Miguel Arias Cañete, whose staff said he is in regular contact with the White House, took a more conciliatory tone yesterday. "We all continue to hope the U.S. will find a way to remain within the Paris Agreement and to remain committed to the Paris goals," he said. "Fossil fuels will continue to play a role for many countries on the path towards decarbonization. So there is room for a new U.S. administration to chart its own path, as well," he added, in a possible reference to the NDC issue. Tubiana's views stand in stark contrast to those expressed by Obama's former special envoy for climate change, Todd Stern, who said in an interview with E&E News last week that the United States painstakingly negotiated language in advance of Paris to allow countries to modify their commitments in either direction. While Tubiana said backtracking would imperil the deal, Stern said it would ensure its longevity (Climatewire, May 1). Other Paris negotiators told a similar story, in some cases crediting the U.S. delegation with foresight in resisting bids by other countries to insert language into the deal that would have mandated that commitments become tighter over time. An international source closely involved in the negotiations, who faced off with the United States on this issue during the 2013 climate talks in Warsaw, Poland, said he was glad Stern's team kept that more prescriptive language out of the text. "I hated it at the time, but actually, in hindsight, it was genius," he said. That source and others say the more permissive language — which centers on the word "may," instead of "shall" — is partly to thank for the more than 170 countries that have now offered their NDCs. It helped them feel confident that if they fell short, they wouldn't be penalized. But while those sources were unwilling to go on the record for fear of seeming to excuse diminishing U.S. ambition, opponents of that view were less circumspect. Former Indian Minister of Environment Jairam Ramesh's reading of Article 4.11 and 4.3 — which states that each pledge "will represent a progression beyond" the previous one — is more in line with Tubiana's. "The absence of clear legal language precluding downward adjustment cannot mean that downward adjustment is possible," he said. "This will defeat the soul and spirit of the Paris Agreement." "I think any further negotiations will get vitiated by unilateral U.S. action," he added. "I don't expect China and India to follow the U.S. example, since both countries will aspire to assume the leadership mantle." A diplomat for a developing country suggested that the White House avoid any controversy by rescinding the 2025 target and putting forward a 2030 goal that "reflects current policy." He proposed a nominally stronger one, like perhaps a 28.5 percent cut compared with 2005 levels, rather than the 26 to 28 percent reduction. But it's not clear if that would track with Trump's domestic goals. Analysis shows that Obama-era regulations would have fallen short of his 2025 target. Now, with policies like EPA's Clean Power Plan on the chopping block, that gulf will widen. Trump administration officials who favor remaining in Paris have suggested a weakened NDC that reflects business as usual. U.S. supporters have also done little to give Trump cover to stay in Paris. Twelve Democratic governors highlighted the pledge of a 26 to 28 percent cut by 2025 in a letter to Trump yesterday after it was reported that Trump was on the verge of quitting the agreement. "Maintaining the U.S. commitment is essential to protect our residents, and indeed, all Americans from the potentially catastrophic impacts of a changing climate," they wrote, calling it "readily achievable." U.S. environmental groups have been largely quiet on the issue. Oxfam America and the Sierra Club have pronounced that lowering the NDC would be disastrous. Jake Schmidt of the Natural Resources Defense Council called it "ludicrous" that Paris would factor in lawsuits, but added that proponents were shy to discuss the NDC issue for fear of creating a precedent under which other countries might also decrease their ambition. "For years and years, we've been trying to get other countries into agreement, and if you kind of create this clear signal that it's OK to weaken your targets and there will be no blowback, that's another story," he said. But he acknowledged that there are no penalties in the Paris Agreement. Alex Hanafi, senior manager of multilateral climate strategy at the Environmental Defense Fund, said White House opponents of Paris have stoked the controversy to push Trump to exit the deal. "They want to make it look like the U.S. legally has to leave, or otherwise it won't be able to weaken its target," he said. "And I think that's legally incorrect." He called the Article 4.11 language intentionally "wishy-washy" and expressed surprise that the White House counsel's office could think it obligates the United States legally. In a Twitter exchange today, in response to this article, Tubiana said the United States' obligation to stay the course is politically binding, though not legally required.